What is it about Arizona State football that they cannot build a winning tradition? According to what I know, Arizona State has a fairly new state-of-the-art facility for their athletic programs, they have had excellent recruits from all over the country (with many players ending up in the NFL), and have had winning coaches (current coach having won two national championships). In addition to that, Arizona State has a new indoor practice facility and fantastic weather that would make ASU a destination location for any college football prospect. So why is it that it has been so long since Arizona State has had a successful, winning program? 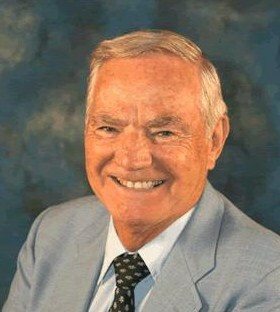 Frank Kush had built up quite a winning tradition with Arizona State football between the years 1958-1979. During his 22 year stint as head coach, he had 13 years with 8 wins or more, 2 undefeated seasons, was 3rd or higher in the conference all but one year, and had only one losing season. His overall record was 176-54-1, giving him a winning percentage of .764. Ever since then, the wins have been few and far between. What was it that happened after Frank Kush left in 1979, and why is it that Arizona State could not continue their winning tradition? There have been seven head coaches since Frank Kush left, and none has had as high of a winning percentage, or as much success. There were a couple of coaches, Darryl Rogers and John Cooper, who came right after the Kush era who seemed to be on the winning track, but they only lasted 5 years and 3 years respectively. Darryl went on to coach in the NFL, and John went on to coach Ohio State for 13 years, and compile a record of 111-43-4 (.705). For whatever reason, Arizona State University could not keep either of these successful college coaches very long, and they both headed for greener pastures. I feel that if either of these coaches would have stayed at Arizona State, they could have continued the long-standing winning tradition that was started by Frank Kush. After John Cooper left, Larry Marmie came in and coached 4 years from 1988-1991. He compiled a record of 22-21-1, just barely over .500. 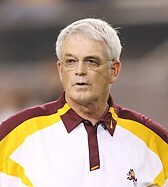 Bruce Snyder replaced Larry Marmie from 1992-2000, and in 9 years compiled a record of 58-47, again a winning percentage in the .500’s. He did have two good seasons during his tenure, and in 1996 came 19 seconds away from an undefeated season and a national championship with Jake Plummer as his quarterback. Talk about irony, he ended up losing to John Cooper’s Ohio State team, whose quarterback was a local Mesa, AZ prospect named Joe Germaine. After Bruce Snyder left, Arizona State hired an up-and-coming coach named Dirk Koetter from Boise State, where in his last two years with the Broncos was 20-5 and won two straight bowl games. His first year with Arizona State, he went 4-7, and things did not get much better through 2006, his final year at ASU. His combined record in six years was 40-34, again barely winning more than half his games. Dennis Erickson came in as the newest savior the the ASU football program, that had now been struggling for 19 years. He had previously won two national championships at Miami, so there were high expectations. He came in and had immediate success in 2007, garnering a 10-3 record and tied for first place in the Pac-10 Division. Since then, the football program at ASU has dropped back down to mediocrity, and Dennis Erickson has compiled a measly 15-21 record after his first year at Arizona State. Dennis Erickson has been head coach of Arizona State University for four years now, and the program still seems to be going nowhere. His overall winning percentage is .510. Is it time for another coaching change, or does something else have to change with the ASU football program in order to rebuild a winning tradition. With the updated state-of-the-art athletics facility, new indoor practice field, large student population, excellent weather, national recruiting, and superior coaching, what else is needed to build a winning football program? I still wonder what it is going to take to get the Arizona State football program back to it’s winning ways from the 60’s, 70’s, and early 80’s. ~ by Troy Erickson Realtor on December 15, 2010.